Despite continued efforts in synthetics, down is the best insulator on Earth. It’s warmth-to-weight ratio and compressibility are unbeatable, and it’s extremely soft and cozy too. To better understand the world of down, below we break down things like fill power, fill weight, goose vs. duck down, and new technologies in treated down. We also address some of the tough ethical questions facing the outdoor industry and give you some tips for extending the life of your down products. Fill power measures the quality and loft of down. The higher the number (800 fill, 700 fill, 600 fill, etc. ), the better the down and the more loft and warmth it will provide. Fill power is calculated by how much space 1 ounce of down clusters takes up in a cylindrical tube (1 ounce of 800-fill power down will loft to 800 cubic inches, 1 ounce of 700-fill power down will loft to 700 cubic inches, etc.). Loftier down gets the highest ratings, and it’s the warmest, lightest, and most compressible. For outdoor gear, the heart of the down fill power range is 900 to 500. Premium outdoor apparel companies like Feathered Friends in Seattle use mostly 900-fill down in its jackets and sleeping bags. These are best suited for serious backpackers and climbers who want the ultimate in performance and weight savings. Other top clothing brands like Patagonia use 800-fill power down in their immensely popular Down Sweater. 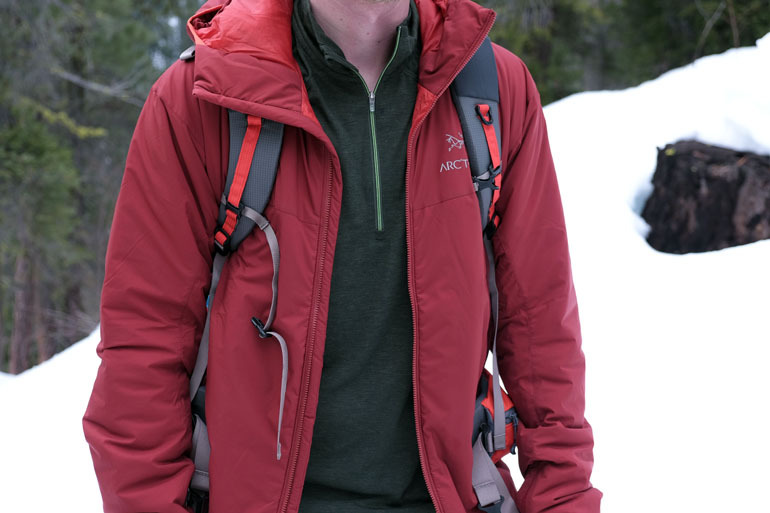 REI uses 650-fill power down in its wallet-friendly Co-Op Down Jacket. There are a couple of 1,000-fill power jackets like the new Rab Zero G, but those are novelty times that are too expensive and rare for mass production. Some casual jackets dip down to 500-fill power and below, but at those levels you are sacrificing a significant amount of warmth for the weight and therefore losing much of the benefits. Down fill power gets the most press—you’ll sometimes see “800 fill” literally sewn onto the sleeve or shoulder of a jacket to advertise how high quality it is. However, fill weight—the total amount of down stuffed into a jacket or sleeping bag—is just as important. This is the weight of insulation in the jacket, measured in ounces, and will give you a good indication of how much warmth it will provide. A typical lightweight down jacket might have 3 ounces of down fill, while a midweight jacket might have 5 or 6 ounces. Serious winter jackets and parkas can have much more than that. It’s easiest to judge fill weight when the fill powers are the same or similar. For example, a jacket with 6 ounces of 800-fill down will be substantially warmer than a jacket with 3-ounces of 800-fill down—that’s double the amount of insulation. But if you are comparing 6 ounces of 600-fill down against 3 ounces of 900-fill down, the calculation becomes trickier. For these reasons, we like to take both numbers into account and include both fill power and weight in the product specs throughout our site. Fill power is important, but don’t overlook fill weight. A third consideration for down is the type of bird it comes from. Down comes from the plumage of both geese and ducks—it’s not actually the feathers, but the soft clusters beneath the feathers that make up the insulation in your jacket or sleeping bag. Down is a food byproduct (at least in theory, more on ethics below), meaning that it comes from birds that are used for food. There are differences between the birds and a lot of statements swirling around the quality of their respective down, so we’ll clarify as best we can. First, geese generally are larger than ducks and more mature when taken for food, so the down has a higher average fill power. You can find low-grade goose down and high-grade duck down, but on average goose down clusters are larger and loftier. Second, duck down is rumored to have slightly more of an odor. Ducks have a more diverse diet, while geese eat mostly grass, and therefore duck down can be oilier. It’s worth noting that almost all down found in good outdoor products has been cleaned, so there should be virtually no odor with either type. We’ve never noticed the difference and can’t substantiate the claim, but it’s certainly out there. For these reasons, goose down is considered to be being the better of the two. However, duck down is more readily available because ducks are a more common source of food, so you’ll see plenty of duck down on the market, and particularly in mid-range and budget products. Most premium down products are made with goose down. Down is known for its impressive warmth-to-weight ratio, compressibility, and overall comfort. In terms of warmth, nothing can rival down—not even the best synthetics on the market that have been specifically engineered to mimic the qualities of down. A number of our favorite down jackets are less than 10 ounces all-in and pack to the size of a water bottle, which just can’t be replicated by any other type of insulation. For almost all serious trips into the backcountry where weight and warmth are critical, down is the clear insulation of choice. Down also is the coziest and most comfortable type of insulation. This is why you’ll find it in expensive down comforters, warm winter jackets, and high-end sleeping bags. The high loft of down makes it lightweight and super soft, and synthetics tend to feel more like a sheet of insulation than puffy clusters. Where down lags behind synthetic insulation is its ability to insulate when wet. When exposed to moisture, down clusters tend to soak up water and don’t insulate nearly as well, which can be a real issue if you are depending on it for warmth. Accordingly, many down products these days use a DWR (Durable Water Repellent) treatment on the shell fabric and even treat the down itself to help it resist water (more on that below). And when heading into the backcountry, we always use waterproof compression sacks for our sleeping bags and jackets to ensure that they stay dry. In truly wet conditions or when weight isn’t an issue, synthetic insulation has its advantages. For a deeper dive into this topic, see our article on down vs. synthetic insulation. We know that down loses its ability to insulate when wet, but there are a number of ways that manufactures combat this. 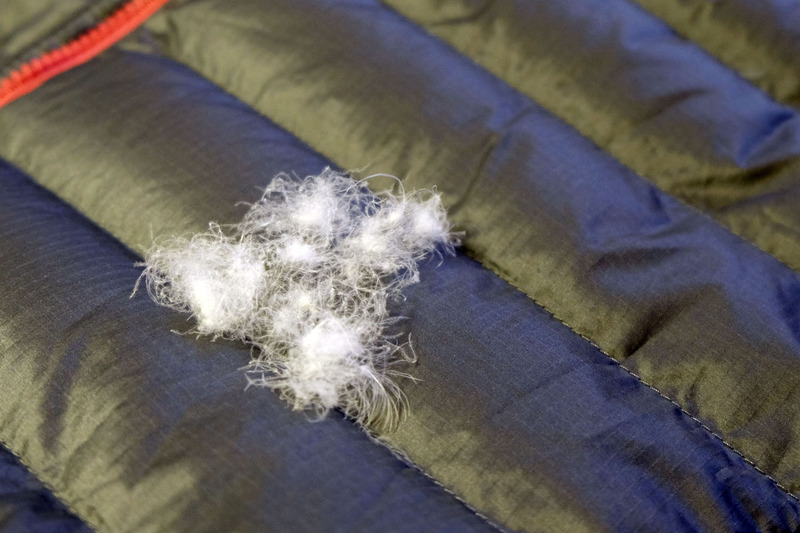 First, many down jackets and sleeping bags have a DWR finish on the outside so that water beads off instead of soaking in. This can be effective in light to moderate perception but DWR won’t protect your down during any kind of heavy perception or exposure. Over the last handful of years, water repellent down has emerged. The process involves adding a treatment to the down itself that reduces water absorption, helps it dry faster, and retain its loft. DownTek is the market leader, and the company claims that the treated down retains the same fill power and has no measurable increase in weight. A DWR treatment on the shell of your jacket or sleeping bag along with treated down on the inside combines to give a solid boost in water resistance. We still recommend taking the proper precautions to stay dry and use dry bags for your critical down gear. DownTek claims a 30% reduction in water absorption after the treatment, which is notable but certainly not a true barrier to entry. The ethics of down are an increasingly touchy subject and one that manufacturers certainly have an ear to. It starts with the notion that down always should be harvested from the bird after it has been slaughtered for food or gathered after it has fallen naturally. Live plucking (exactly as it sounds) is a highly frowned upon and cruel practice that many companies actively are fighting against. It is a reality that live plucking still exists, which allows for the down of the goose or duck to be harvested multiple times. A large percentage of down comes from China, and oversight has increased significantly but still is far from perfect. The Responsible Down Standard (RDS) has emerged as universal criteria for whether or not down is ethically sourced. This is a very positive step in the right direction and a large number of brands are using down that meets this standard (Mountain Hardwear, Black Diamond, Feathered Friends, Outdoor Research, and L.L. Bean just to name a few). Patagonia has created its own criteria called Traceable Down, which has been praised for achieving the “highest tier” of animal welfare. We read a lot of articles while researching for this one, including from leading animal-welfare organization PETA. As fellow outdoor enthusiasts, we enjoy down products and depend on their warmth, but it’s imperative that animal cruelty such as live plucking ceases to exist. We praise the companies that hold themselves to the highest possible ethical standards in down products and support continued and increasing oversight. Once you’ve plunked down the dough for a pricey down jacket or sleeping bag, it’s worth taking proper care of it to ensure a long life span. First, make sure to store your down uncompressed if possible. 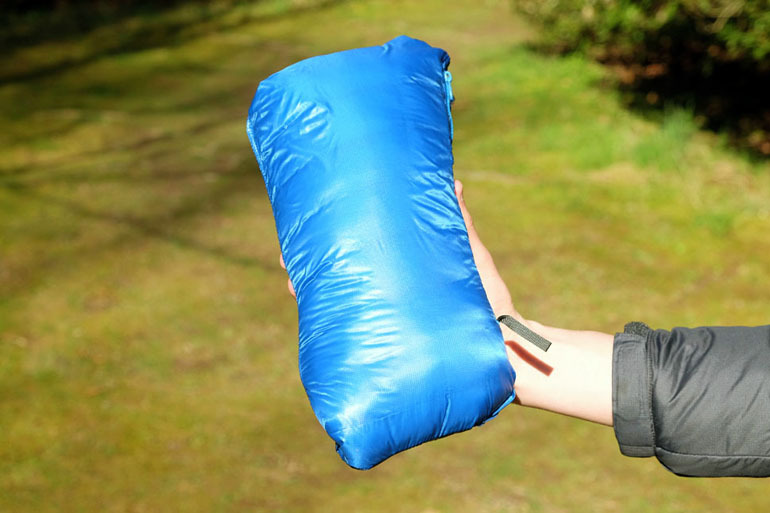 Many down sleeping bags come with two storage options: a small stuff sack for backpacking and a larger bag for storage that lets it expand to its full size. This takes up more space in your home, but storing down compressed in a small stuff sack can cause permanent damage to the loft and it may never fully bounce back. Second, good cleaning can extend the life of your down product. Dirt and oils from your body can eventually make their way into the down and cause it to lose its loft. For sleeping bags in particular, one way to avoid this is by using a thin silk liner. Not only are these liners comfortable, they form a thin barrier between you and your bag that keeps it clean and oil-free. And if a cluster of down or errant feather makes its way through the shell of your gear, it’s best to gently massage it back in as opposed to pulling it out. As we’ve mentioned above, we depend heavily on down for most serious outdoor pursuits. Its warmth-to-weight ratio and compressibility are unbeatable and it’s darn cozy too. 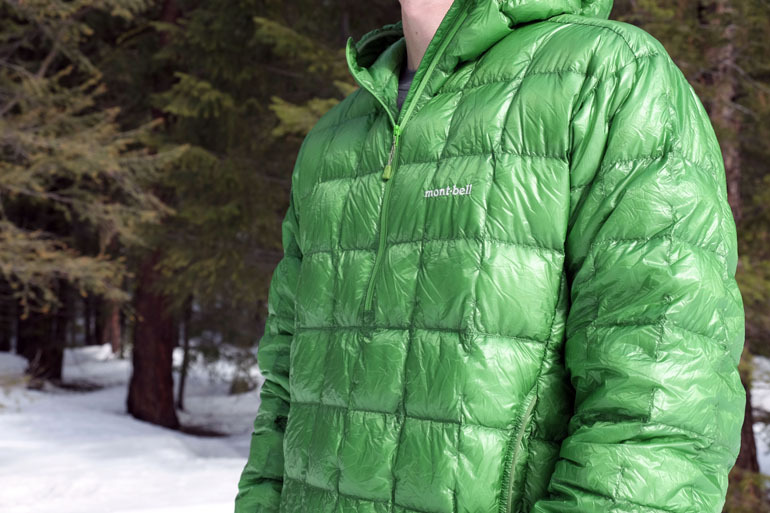 For backcountry trips, we carry a down jacket for warmth, usually of the lightweight variety. Almost all of our recommended backpacking sleeping bags are made with down. For winter sports and downhill skiing in particular, some ski jackets and ski pants use down insulation for added warmth. And if you’re interested in what’s available on the other side of the tracks, see our article on the best synthetic jackets. They aren’t so bad after all and do offer better water resistance and breathability.